My Little Slice of Bliss: Happy Fat Tuesday! It's hard to believe that Ash Wednesday is just about here--even though it is soooooooo late this year. It always seems to sneak up on me! Anyway, that means that today is Fat Tuesday, or Mardi Gras. My HS freshman daughter's French 2 class is celebrating Mardi Gras today at school. She took on the "culinary expert" role for her group's project (another group member is researching the history of French Mardi Gras traditions, and someone else is reporting on some other aspect which completely escapes me at the moment!). Her assignment: research and bake a King Cake to share with the class. She and I worked together last night to bake the cake and had such a blast doing it! 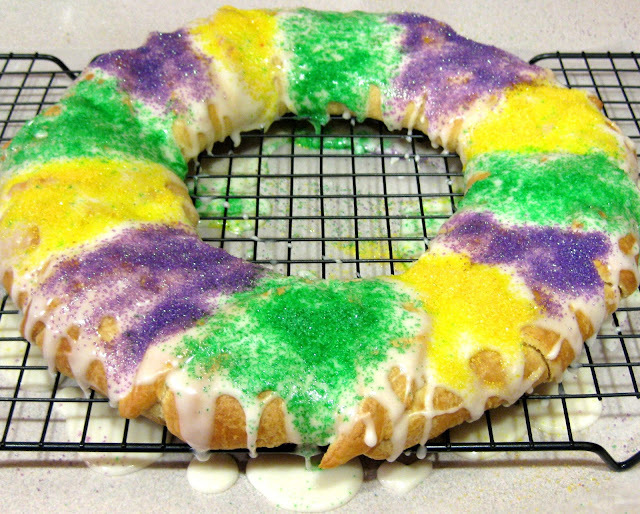 The Gulf Coast-style King Cake that we made is a cinnamon-filled coffee ring, and while it baked, the house smelled heavenly!! She was so pleased with how it turned out. We cut it into small wedges for sampling (as well as to make it easier for her to carry it to school). After we'd cut 36 wedges for sharing and completely filled the plastic container for transporting them, we still had about 1/4 of the cake left. Guess what we're having for dessert after supper tonight!!!! Yum!! The recipe my daughter found (you can find it HERE) was really simple--it's based on Pillsbury Crescent Rolls!! I think we'll be adding this recipe to the "keepers" file ;). And while I'm sharing non-crafting photos, I thought I'd share a photo of some visitors we had last week. Last week I noticed that a lot of deer have been hanging out in our neighborhood. One morning I saw about 20 deer amble down our road just before sunrise. 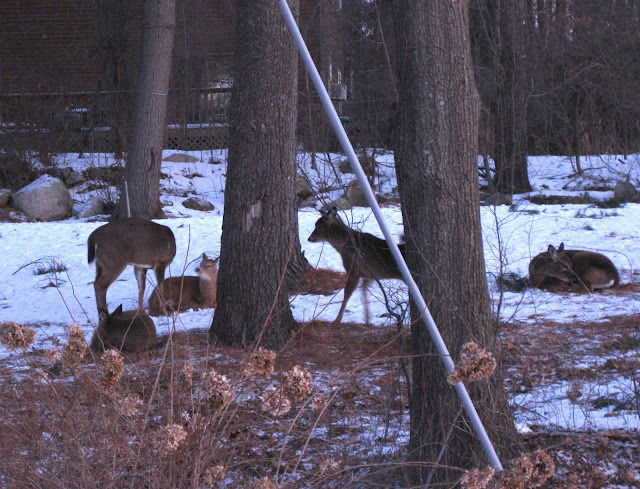 Just before bedtime that evening, we spotted five or six deer bedding down in our neighbors' yard. I was stunned the next morning to see them still there, right out in the open! I grabbed my camera for this shot, taken right through the sidelight windows of our front door, not quite 30 feet away. The sun was just starting to come up, and they were just getting ready to move on. Well, I have tons to do today, so I've got to be moving along. I hope that my daughter's Mardi Gras celebration goes well today--and I hope that you have a fabulous day yourself! in one of the slices? It was always called Pancake Day when I was growing up. My parents always had to have big large pancakes. Love your daughter's cake. It's so pretty! Looks like she is talented like her Mom. :) Enjoy your dessert tonight. Yummy! The deer are thick around here as well. I am scared to go out driving after dusk. They are thick along our road. What a fun project for your daughter!! Looks like she did a YUMMY job too!! I saw three deer on my walk with Max this morning!! You got a great photo of your visitors! Wow, good thing I stopped for a visit,because I didn't realize this is Shrove Tuesday; thank you for the reminder! I know my mom will be serving pancakes for supper tonight at her place - makes me wish we lived closer, because I know what I'd be doing! Your daughter's cake looks fabulous and I'm sure her classmates will enjoy it immensely. The photos of the deer: lovely! We live in a small town and see plenty of elk (more often then deer), bedding down in open areas, or wandering down the roads. They can be quite the site (but they're big and scary!). Deer, now...gentle and sweet! Happy Fat Tuesday to you!! Looks just as it should for a Mardi Gras cake. Ooh, I do love cinnamon so I'm thinking that is delish! The photo of your deer is awesome. What a beautiful sight. You did a great job on the cake. It is so pretty and happy! Love those deer and so many of them. We saw 4 last night as we were driving into our addition. It's the first time since we've lived here and we've been here 7 years! You are the best mom, Emily! Love hearing about the projects you do with your kids & this one looks fabulous & bet it was yummy! Oh how incredible to get pictures of deer laying down! I've seen it a time or 2, but never got a picture. This is wonderful!